Posted on August 14, 2015 by loco wrote in Articles, Featured, Gallery, Image, Loco, Loco SUP Surfing, Surfing, UK SUP, Waves. It has 0 Comment. This article is the result of speaking to a variety of female paddlers over the summer. After getting the basics on flat water it seems girls are increasingly interested in getting into paddle surfing and why wouldn’t they with similar thrills to traditional surfing but it being much easier to master. Although it is definitely possible to catch a wave on an iSUP or large wide style board (32-34”) these options are more compromise rather than correctly matching equipment to any given girl’s weight and ability. By far the biggest issue we’ve encountered is ‘why can’t I turn the board like the boys?’ The answer is pretty simple your board is too big! Unless you’re a bigger girl there is no reason for any lady to be riding anything bigger than 9’0” and 30” wide in the surf. Even at these dimensions footwork needs to be spot on or you’ll still struggle to make the most of the swell. Other considerations include a bigger board being more unwieldy and harder to control not only getting out back over the white water but also when you fall off. No one likes getting dragged unceremoniously back to the beach by the ankle it can be scary and soon zap your energy levels! So what’s a good compromise? Generally speaking once you’ve got the basics of paddle boarding and can happily catch a 1-2′ wave back to the beach without too much trouble you’re probably ready to start thinking about ‘going down the line’ and trying your hand at bottom and top turns. Admittedly the paddle plays an integral role in turning a paddle board especially at the competitive end of the sport but having a weight-relevant plank is certainly going to make those first baby steps much easier. 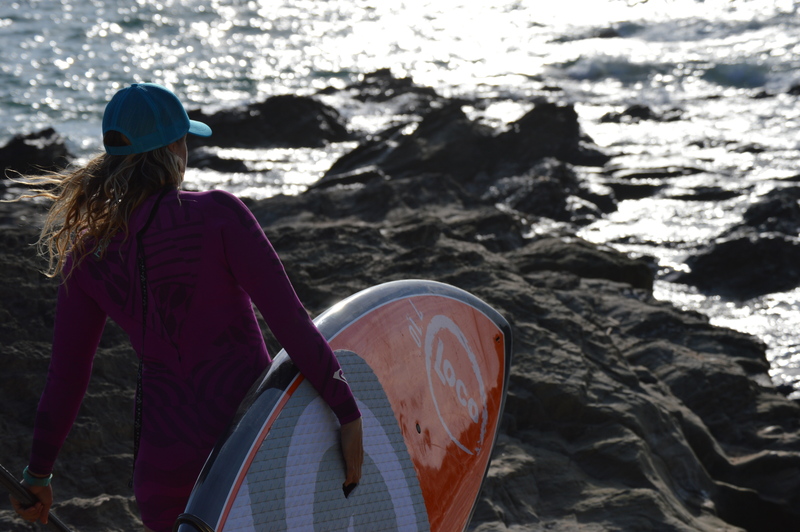 Loco team rider Tina, who weighs approximately 65kg, started her rise to competitive success on our 7’10” x 29” Short SUP which despite being worrying short if you’re coming down from a 10’6” iSUP packs a generous 115L of volume making it both buoyant and manoeuvrable. After just 3 months Tina fed back that she really needed something even smaller so she could dominate the board in larger waves and get the tail to slide more readily off the top turn. She’s now uses our 7’4” x 28” Short SUP for smaller waves and our 7’9” x 27.25” Comp Pro once the surf gets above 3-4′. Admittedly Tina comes from a surfing background so she already had some know how in the waves but girls crossing over from windsurfing, kite boarding or wake boarding should also have the necessary balance and muscle memory to get straight onto a small SUP without too much trouble. Even if you have zero surf experience but the surf side of SUP pushes your buttons we still recommend going for an all-rounder hard board in the 9′ range. Despite the marketing mumbo jumbo currently being bounded around by the big brands iSUPs just don’t turn as well as hard boards due to them having rounded rails. You need sharp rails to make half decent turns in the surf it’s that cut and dry! 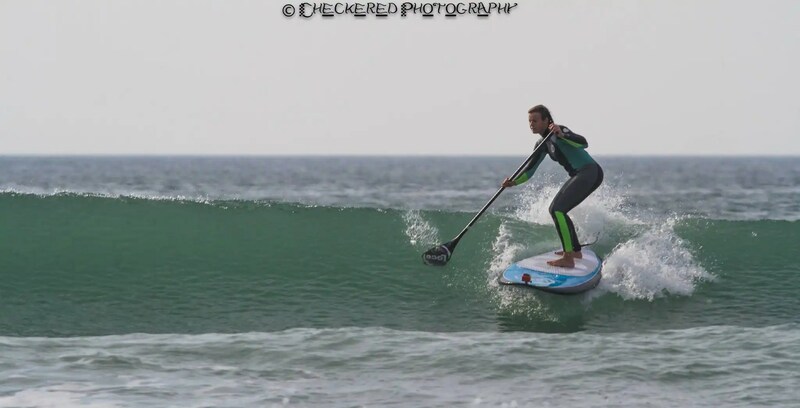 Riding your other half’s board is always going to be a compromise and once you’re ripping on a size-specific SUP you’ll wonder why you settled for second best for so long?! Another benefit of 7-8′ boards is that they fit into small hatchbacks eradicating the need for roof racks, are much easier to carry and store and don’t require inflating every time you want to use them. 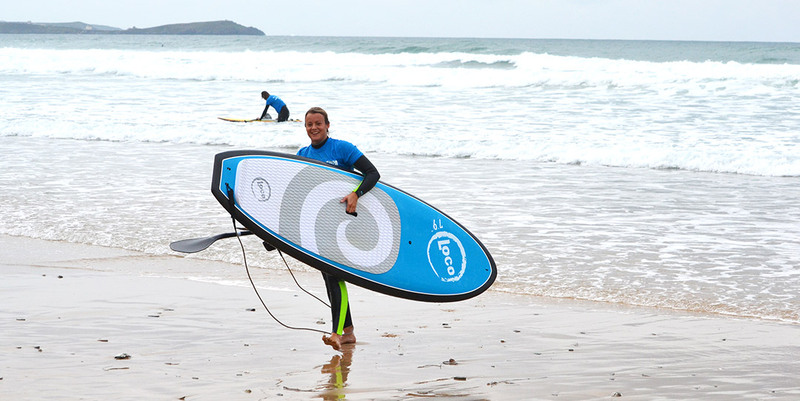 Loco are proud to support some of the UK’s top female paddle surfers and are always keen to encourage new talent into this side of the sport so if you’re thinking about a shorter SUP for wavy days then it’s always worthwhile getting in touch to discuss our ambassador and team rider programmes. Whichever size and shape you ultimately decide to go for remember to be safe on those bigger days. Any ladies interested in fast track paddle surfing clinics stay tuned for Joe’s UK and foreign dates for this coming Autumn/Winter. He’ll have you ripping in no time guaranteed. What’s the perfect SUP Paddle Length?